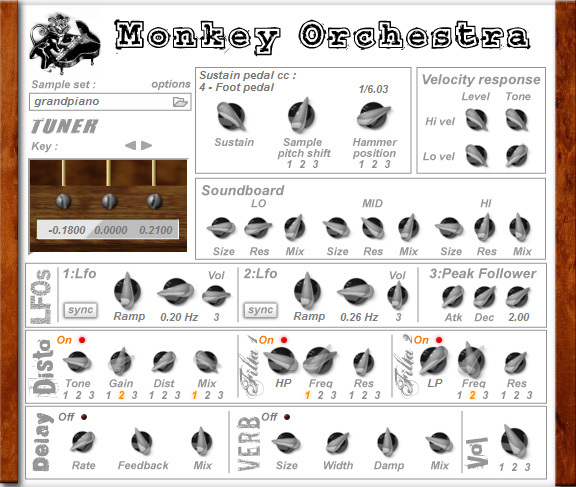 Monkey Orchestra is a synth based on a piano string structure model. It has 88 independant keys. 10 lowest trigger 1 string, 18 next trigger 2 strings, 60 highest trigger 3 strings, wich makes a lot of strings. You can tune each 226 strings individually. The strings are fed by (very) short samples. Most of the controls can be triggered by Lfos or peak follower.